Is the Canon 18-135 STM Lens the perfect kit lens upgrade? In this video we take a look at the Canon 18-135 STM Lens and ask is this the perfect kit lens upgrade? Many new Canon cameras come with an 18-55mm kit lens. People are often surprised about how limiting that range can actually be and quickly look to upgrade. The Canon 18-135 STM Lens offers an impressive range so may seem like on obvious upgrade at the time of purchase or as a replacement for the 18-55mm. So let's delve into this and have a look. The Canon 18-135 STM Lens is an EF-S lens so is only suitable for APS-C cameras like the Canon 750d/Rebel T6i or Canon 80d. With the crop factor of those cameras taken into account, the lens has a 35mm equivalent of 29-216mm. This is an amazing range that will be suitable for so many different areas of photography. When starting out in photography, this versatility is extremely useful allowing you to try lots of different styles of photography without having to switch lenses all the time and invest more money. The lens has a maximum aperture between f/3.5 and f/5.6 depending on the focal length you are using. This is very similar to the 18-55mm kit lens. However thanks to those longer focal lengths, a much better background blur can be achieved. With 7 aperture blades the bokeh is not as creamy as you might find in more expensive lenses but anything from 85mm and above will achieve decent results. In the pictures below you can see the bokeh effect at 85mm, 100mm and 135mm. This works well for portraits where the subject can be isolated. The Canon 18-135 STM has 4-stop image stabilisation that is extremely useful on a lens with this focal range. The image stabilisation is particularly impressive on this lens. The IS on the Canon 18-135 STM performs better than the 18-55mm at the same focal range. At the longer focal lengths the stabilisation is capable of smoothing out some pretty severe movements. This is especially useful for shooting video and can provide some very steady footage even when handheld like this shot. The stabilisation also improves low light performance allowing you to reduce your shutter speed up to 4 stops slower than normal. The Canon 18-135 STM also has the STM focus motor meaning smooth focus adjustments can be made whilst shooting video. Taking a quick look around the Canon 18-135 STM the thing that instantly strikes is the quality is slightly improved over the 18-55mm. It feels solid and the metal mount adds a little extra strength although like all EF-S lenses it is not weather sealed. The zoom ring is nice and smooth and has a lock switch you can employ to lock the zoom at 18mm. There is the IS switch and the autofocus switch on the side. The focus on this lens is a focus by wire system, like the other STM lenses, meaning the camera has to be powered on for the focus to function whether in autofocus or manual. The focus ring turns easily and smoothly although it feels a little loose. This should not cause too many issues thanks to the focus by wire system. Autofocus is accurate and fast enough for most situations. Image quality of the Canon 18-135 STM is at the level you would expect for a lens in this price range. It is not the sharpest lens in the box but the quality is very reasonable for a lens with this amount of zoom range. At the wide end, the lens acts as a perfectly reasonable landscaping lens. The ability to zoom in so far also opens up opportunities that do not always exist when going out to shoot landscapes with a wide angle or normal kit lens. 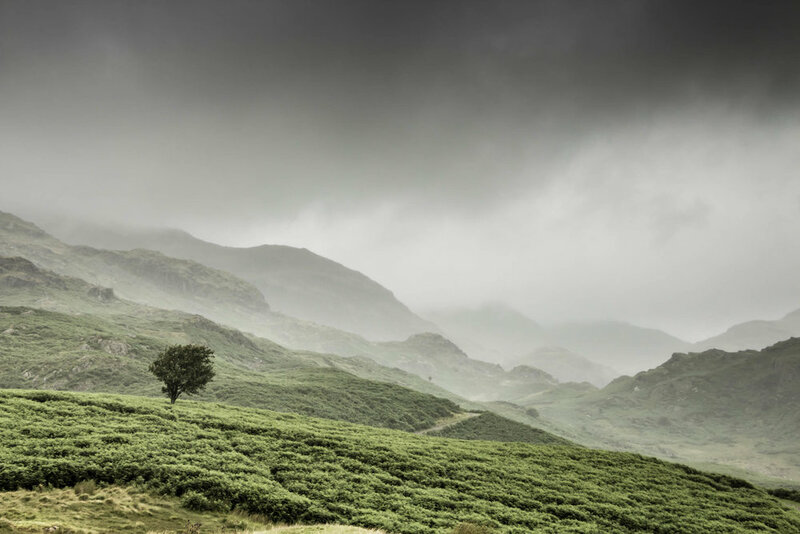 This shot of the misty Lake District mountains shows the kind of landscape images that can be captured at longer focal lengths. If you want to take your landscapes even further the Canon 10-18mm matches up very nicely to this lens giving you a combined focal range from 10-135mm for relatively little money. This lens is £275/$285 so it’s offering very good value for money when it comes to camera lenses, particularly in the US. Alternatives include lenses with an 18-200mm zoom range from Sigma, Tamron and Canon themselves. These are older lenses though. The quality does not quite match up to this one and they don't have that all important STM focus motor that makes this lens so good for video. Overall I really like the Canon 18-135 STM. Thanks to the versatility and the excellent image stabilisation the lens was a joy to use for both still images and videos. With good build quality and more than reasonable image quality this lens will be the only lens many casual shooters will ever need. If you are looking to buy a good quality family camera system with the versatility to do a few other things then this is the lens for you. If you are buying your first DSLR camera I would heartily recommend getting it with this lens as opposed to the standard 18-55mm. If you already own the 18-55mm this lens could be a worthy upgrade, particularly if you are not interested in changing lenses too often and just want a DSLR that is ready for anything.